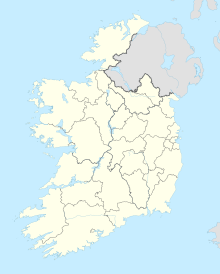 The Buttevant Rail Disaster was a train crash that occurred at Buttevant Railway Station, County Cork in the Ireland, 137 miles from Heuston Station on the Dublin to Cork main line, on 1 August 1980. More than 70 people were injured, and 18 died, resulting as one of Ireland's worst rail disasters to ever occur and the country's worst rail disaster during peacetime history. At 12:45 the 10:00 am Dublin (Heuston) to Cork (Kent) express train entered Buttevant station carrying some 230 bank holiday passengers. The train was diverted off the main line across a 1:8 temporary set of points into a siding. The locomotive remained upright but carriages immediately behind the engine and generator van jack-knifed and were thrown across four sets of rail lines. Two coaches and the dining car were totally demolished by the impact. It resulted in the deaths of 18 people and over 70 people being injured. The accident happened because a set of manual facing points were set to direct the train into the siding. These points were installed about four months previously and had not been connected to the signal cabin. The permanent way maintenance staff were expecting a stationary locomotive at the Up platform to move into the siding, and had set the points for the diversion to the siding, without obtaining permission from the signalman. Upon seeing that this had been done, the signalman at Buttevant manually set the signals to the Danger aspect and informed the pointsman to reset the points. The train was travelling too fast to stop in time. The derailment occurred at around 60 mph (97 km/h). Local doctor Finbarr Kennedy was on hand at the time of the crash, while waiting to cross the line, and was able to give aid to those injured. The train consisted of 071 Class locomotive number 075, a generator van and 11 coaches. Six of the coaches consisted of wooden bodies on steel underframes. Four of these were either destroyed or badly damaged in the impact, the two which survived being at the rear of the train. The remainder of the coaches were light alloy Cravens stock; most of which survived the crash. The generator van, a modified BR Mark 1, was severely damaged. All of the vehicles were coupled using screw shackle couplings. This event, and the subsequent Cherryville junction accident, which killed a further seven people, accounted for 70% of all Irish rail deaths over a 28-year period. CIÉ and the Government came under severe public pressure to improve safety and to modernise the fleet. A major review of the national rail safety policy was held and resulted in the rapid elimination of the wooden-bodied coaches that had formed part of the train. The passengers who were most severely injured or killed were seated in coaches with wooden frames. This structure was incapable of surviving a high speed crash and did not come near to the safety standards provided by modern (post-1950s) metal-body coaches. The expert bodies that reviewed that accident discovered that the old timber-frame carriage bodies mounted on a steel frame were totally inadequate as they were prone to complete collapse (the "accordion" effect) under the enormous compression forces of a high-speed collision. While the steel underbody remained structurally intact, other carriages could "mount" the frame, completely compress and destroy the wooden frame body. The more modern steel-framed carriage bodies survived due to their greater structural rigidity. On this basis the decision to purchase a new fleet of modern intercity coaches based on the British Rail Mark 3 design was quickly made. The Mark 3's longitudinally corrugated roof can survive compression forces of over 300 tonnes. These coaches, an already well proven design, were built by BREL in Derby, England and, under licence, at CIÉ's own workshops at Inchicore in Dublin between 1983 and 1989. On 8 August 2005, a commemoration marking the 25th anniversary was held at the station. A bronze sculpture in the shape of two crossing train tracks was unveiled alongside a plaque commemorating the names of the victims at the Buttevant Railway station.